Summary: Alexei Romanov, heir to the Russian throne, is in deadly danger. It’s 1916, the struggling Russian people are tired of war and are blaming their Romanov rulers for it, and some are secretly plotting to murder the young heir and his family. But nobody outside the palace knows that Alexei suffers from a terrible bleeding disease, hemophilia, which threatens to finish him off even before the family’s enemies can. The only person able to help Alexei is the evil and powerful religious mystic Rasputin — and now Rasputin is trying to kill him too! Desperate, Alexei flees through time to New York City in 2010, using a method taught to him by the mad monk himself. In New York, Alexei meets smart and sassy Varda Rosenberg, and discovers she is a distant cousin. Varda is working on a gene therapy cure for hemophilia, as the disease still runs in the family. When Alexei learns that history shows that his entire family will be assassinated in 1918, he and Varda travel back in time to the Russian Revolution, with Rasputin hot on their heels. Will they be able to rescue Alexei’s family before it’s too late? I was born in 1904 and on my nynok the fate of Mother Russia was written. It’s no secret I have a slight obsession with The Romanovs. When I saw this book on a shelf at work, I had some reservations (the cover doesn’t appeal to me at all – it’s hard to see in the picture, but on the pendant is a very obvious pasted-on portrait of Alexei Romanov, the author was completely unknown to me although that necessarily isn’t a bad thing, and the plot seemed a little iffy), but knew one way or another I’d wind up reading it. It’s an extremely quick read: the main story is only 247 pages with another 26 pages of author’s notes. Had I read it on a day I was off it would have been a great afternoon read. Instead, it took all of two days. The book opens with Alexei Romanov, heir to the throne of Russia, penning the ‘true story’ of his family. With a revolution on the horizon, many rumors and false truths are being spread about his family and their treatment of their people. One thing I thought was really neat about this novel was the way the footnotes were presented. They were added into the margins, rather than the bottom of the page. This made reading much faster. Unfortunately, it seemed that after a few chapters, the footnotes stopped altogether, despite a fair bit of Russian thrown into conversations. Just then Papa’s face lit up in an angel’s smile. And I knew that my mother must have walked into the room. Only she could make him smile like that. ♥ I’ve said it before and I’ll say it again: Nicky & Alix = my OTP y’all. War has hit Russia and the Romanovs are no longer safe. Add to this the threat of Alexei’s disease – hemophilia – being discovered. No one outside the palace knows of his affliction and the only one able to heal him is Grigory Rasputin, a monk. For the first half of the book, facts presented followed the actual history quite nicely, which I enjoyed. Then the odd time-travel aspect came into play. Rasputin lets Alexei in on a little secret: Alexei only has to close his eyes and concentrate and he’ll travel through the waters of time (pretty literally in fact). However, he must only travel with his mind. Should he travel with his body, he will become stuck and unable to return home. After as assassination attempt gone wrong (it’s actually really fascinating reading about all the tries made to end Rasputin’s life. The man seriously could not be killed! ), Alexei finds himself at the river’s edge with a none-too-pleased monk. Alexei awakens to discover he did not drown like he had assumed. In fact, there is a strange girl kissing him. After a few confused moments, he finds out that the girl was not kissing him, she was simply administering CPR and he is in America. New York to be precise. Varda, the girl who rescued him from the river, insists on taking him to a nearby hospital. However, Alexei adamantly refuses; no one can ever know the tsarevitch is unwell. In the end, she offers to take him to her house instead and it is at this point the book lost me. From the very first page Alexei informed the reader he is writing in English in the event his notebook were to fall into enemy hands. The tsarina was Queen Victoria’s granddaughter and she grew up speaking English. She spoke exclusively in English to her children. Alexei’s writing for the first half of the book was fine, fluent. The moment he found himself in New York, however, his English (both his writing and his speech) became very stunted and broken. While it wasn’t hard to understand him, I had a difficult time believing it. There are stacks of letters that Nicholas & Alix wrote to one another (that still survive to this day) that were in English. The fact that Alexei’s English would suddenly be anything but fluent didn’t sit right with me. I also had a difficult time believing that Varda, a regular 15 year old girl, would have the resources to conduct her own experiments on gene therapy and have a possible cure for hemophilia. When she finds Alexei, she tells him she’s set to attend a hemophilia conference where she’ll announce her findings. This girl is fifteen. And with all of her ‘likes’ and ‘dudes’ thrown into her sentences, I just don’t see this girl being the brilliant scientist she’s purported to be. Varda understandable doesn’t believe that the boy before her is actually the tsarevitch of Russia who was murdered in 1918. However, she whips out her handy dandy science lab and runs a DNA test. Surprise! He actually is a Romanov! Double surprise! So is Varda. The two are distant cousins, but true love laughs in the face of genetics. The day after they meet, Alexei has breakfast with Varda’s mother and mentions wanting to marry Varda. Yeah. Alexei attends school with Varda one day and nearly has a meltdown in history class. The subject of the day is Russian history, specifically the revolution. Because Alexei had left his time a few years previously, he was unaware of the “new” revolution and is horrified upon finding out the tsar and his family were brutally murdered. There’s a random subplot thrown in with Rasputin. He somehow survived and follows Alexei through time. He appears at Varda’s school and disguises himself as a janitor. Later – and I didn’t like this part at all – he pulls the “I am your father” card with Alexei. The pair go back in time and attempt to rescue the Romanovs. Alexei and Varda wind up getting separated, but they still have their phones and Alexei is the one to text that lovely declaration of love. There was much eye-rolling on my part. I won’t give away the ending, but I will say that part of me was surprised. I could see the story going two ways and I guess I subconsciously hadn’t wanted what actually happened to happen. But it did and that’s what the reader is left to deal with. 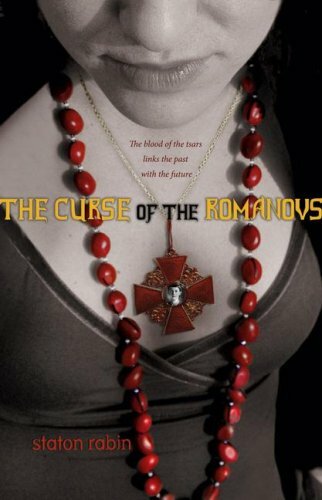 There were many overly cheesey parts in The Curse of the Romanovs, but it was an extremely quick read and the first half was far more enjoyable – and based in fact! The second half didn’t appeal to me nearly as much and I had to push myself to get through certain scenes. The author has a few other books – none of them dealing with the Romanovs it seems – but I don’t think I’ll be reading any of them.